For the past few days I have had a beautiful mooring under the dappled shade of a gorgeous plane tree, skirting Rembrandt Gardens in Little Venice Basin. You can only secure this mooring by pre-booking via email to the delightful and helpful Sarah who runs Rembrandt Moorings. There are only two moorings at that, so I was very pleased when she offered me seven days. 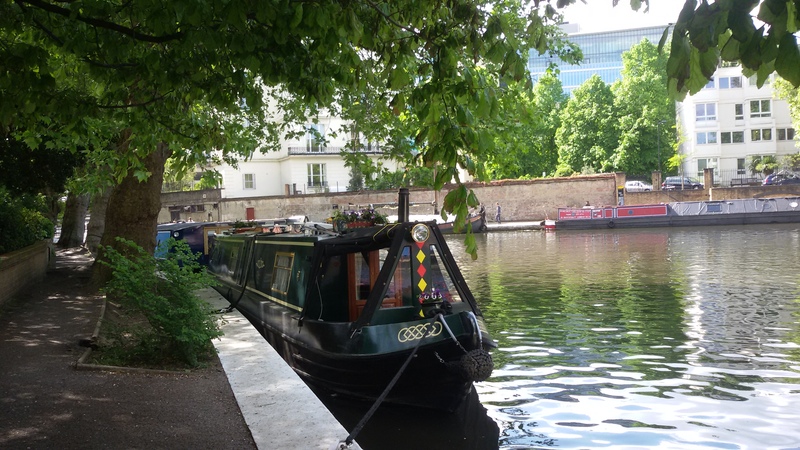 This meant I could move from the not so lovely concrete maze that surrounds the Paddington Arm of the Grand Union, settle in, enjoy what London has to offer, and email the location of the boat to all those coming to the pop-up death café. But I am beginning to learn that things are never that easy when your home is a narrrowboat, and you have access to a finite amount of onboard resources, without which nothing works. 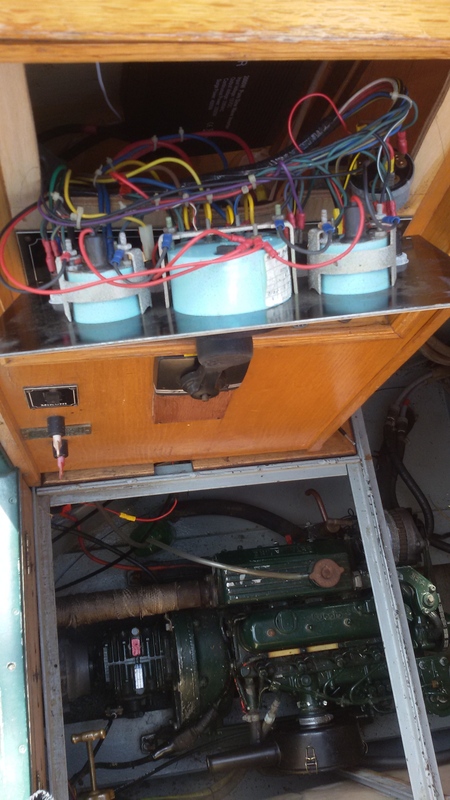 In a previous blog I mentioned that before setting off I needed to invested in new batteries and installed an inverter to provide everyday power in the boat. I couldn’t imagine life without a hairdryer or a vacuum cleaner (albeit it a ‘Feather-light’, which has very little suction), and I had to have 240 volts to fire up my Apple laptop anyway. But this meant I would have to run the engine for at least two to three hours a day to make sure the batteries could cope with the kind of daily output that I used. That’s fine when you are on the move because the engines are firing up the batteries as you chug along, but – even though many boaters do this quite happily – for me I didn’t want to run my engine while moored up for few days. It ruins the peace and tranquility of being on the canals in a beautiful, quiet spot, and eats up fuel. Three solar panels were duly fitted by Tim’s colleague Duncan. He did a smashing job too, and explained how the blue box that he fitted in the engine area has three lines of information so I would always know the amount of amps that are going into the batteries, and how the batteries themselves were doing. He said something about shade and trees, but I confess this went straight over my head, because I was inwardly celebrating how I would never have to worry about my electrics or batteries again. The solar panels have been a triumph. 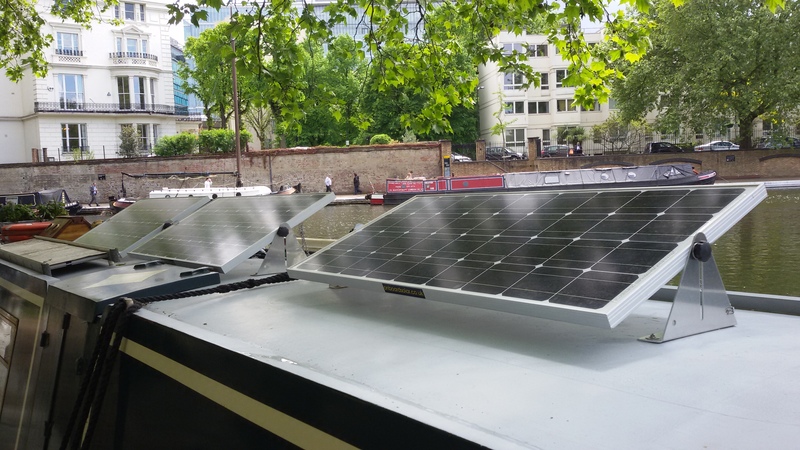 Although there have been other things that have needed attention (such as the electrical feeds coming loose behind the switches that run everything on the boat), the batteries and the solar panels have remained a constant source of joy, and dare I said it, security. Until that is, I moored under the tree at Rembrandt Gardens, and switched off the engine for what I thought would be the duration of my six day stay. I was fine until the fourth morning, when I turned on the Mikuni heater. It failed to ignite. This is extremely annoying because no Mikuni heater means no hot water for my shower. A cold sweat broke out on my forehead. I immediately turned on the engine (fortunately run by a separate battery to the buggered ones, otherwise the entire boat would have ceased to function), and watched anxiously as the battery reading crawled upwards. It seemed to work, so I set off on Mystic Moon to find a water tap to fill up the tank (water is another precious resource that needs constant replenishment). At the water tap I fell into conversation with Bruce, a New Zealander who also happened to be a marine engineer. ‘Can you explain solar panels and batteries,’ I said to him as he helped me maneuver Mystic Moon into a position so the hosepipe could reach her water tank. ‘But, I didn’t know that,’ I wailed, inwardly berating myself for not paying attention to what Duncan had told me. So here I am, suitably chastened, with my engine humming away in the background, hopefully putting life back into my beleaguered batteries, and contemplating this hard-learnt lesson: Ignorance is no excuse when you are in charge of the resources upon which you depend. And, running a hair dryer and vacuum doesn’t seem that important anymore. Irrespective of the damage I have caused my batteries, or the possible cost to put them right, I can’t help thinking about the wider picture either. Our planetary resources are just as delicately and intricately balanced as those on Mystic Moon, and we human beings are in charge. How different our world would be if we all started to educate ourselves about the wondrous things our planet provides for us, learn the importance of taking care of them, and question how much we really need to use. This entry was posted in All posts and tagged batteries. solar panels, lonely female boater, Mystic Moon, narrowboats. Bookmark the permalink.